WESTERN SCENIC MOUNTAIN SUNSET VIEWS FROM THE B&B. IN THE HEART OF CHATTAHOOCHEE NATIONAL FORREST. WATERFALL HIKES & APPALACHIAN TRAIL. B AND B HAS SIX DELUXE ROOMS, WITH LUXURY BATHS WITH GARDEN JETTED TUBS, TV AND INTERNET CONNECTION - FIVE WITH WOOD-BURNING FIREPLACES. LARGE WRAP-AROUND PORCHES AND A SCREENED PORCH FOR DINING IN OUR ABUNDANT GREAT WEATHER. A GREAT ROOM WITH FIREPLACE. 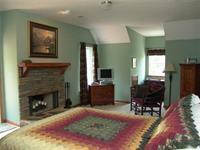 HANDICAPPED ACCESSIBLE WITH AN ADA APPROVED ROOM. TREE TOP SUITE IN THE OWNER'S LODGE - QUEEN BED, PRIVATE DECK AND SCREEN PORCH AND IT IS NOT PART OF THE B and B, BUT DOES INCLUDE A CONTINENTAL BREAKFAST AND MAID SERVICE. 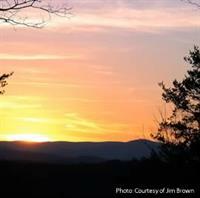 6.5 miles / 10 min from Dahlonega, the heart of wine country. From Dahlonega take Grove St NW 2 miles to a left at Camp Wahsega Rd. 4.7 miles right on Bull Cr Rd. 1/10 mile sharp RT turn up the drive.